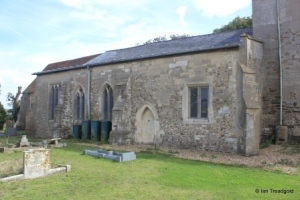 The church of All Saints in Chalgrave is an isolated church. 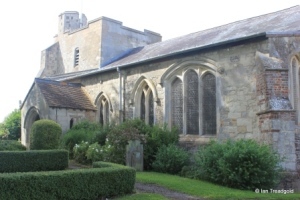 Originally built close to Chalgrave manor, the church served the small hamlets of Tebworth and Wingfield along with the small medieval community at Chalgrave. 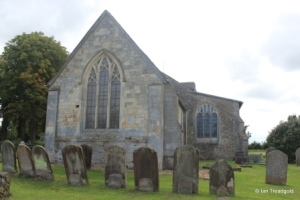 The church lies to the east of the A5120 south of Toddington. Ample parking is available at the church. 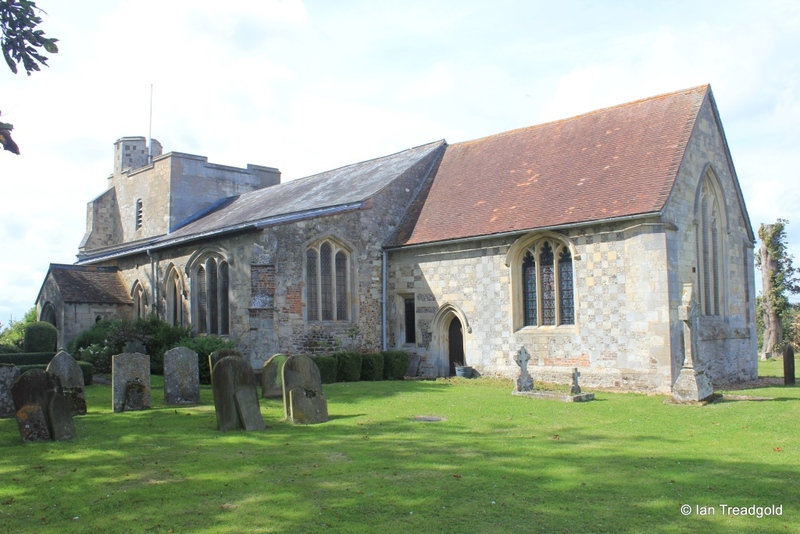 Reference: A Brief Guide to All Saints Church Chalgrave - Booklet available from the church and at the web site. The church has a nave, chancel, two aisles, south porch and truncated west tower. The chancel is about 31 feet by 16, the nave 49 feet by 20 with the two aisles adding 13 feet to the north and 11 to the south. The tower is about 16 feet square and now about 35 feet high. 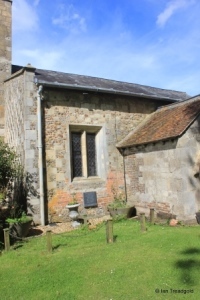 The church is built of local clunch stone along with rubble and ashlar blocks with flint chequerboard facing on the tower. 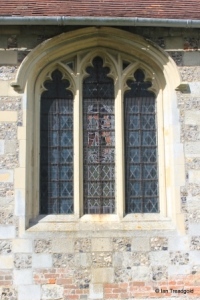 The east window of the south aisle is an uncusped three-light window in a depressed two-centre arch without a label above. 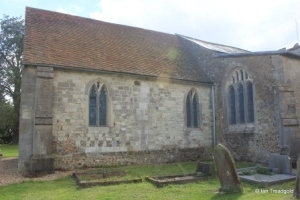 The south aisle has three windows east of the porch with a fourth to the west. 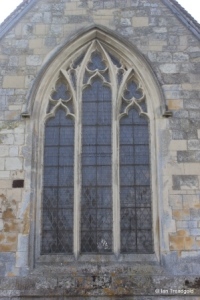 The south-east window of the aisle is similar but wider to the east window, this time with a label above. The middle windows on the south side are both uncusped two-light affairs under pointed arches. 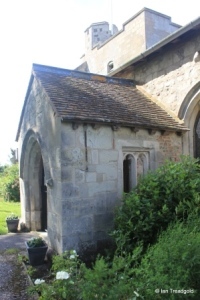 The western most of this pair clearly showing that the porch was built after the aisle. 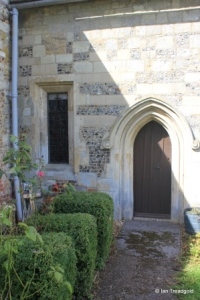 The south porch dates from C15 and protects the doorway which was moved from the south wall of the nave in about 1330. 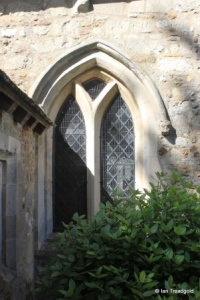 The porch has a small two trefoiled light window under a square head to the east. 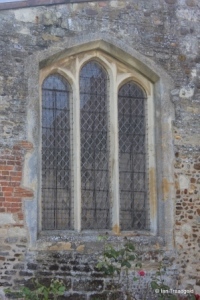 The western most window on the south side is a two-light square headed window. The tower was built originally in about 1380 and formed of three levels and about 60 feet in height. 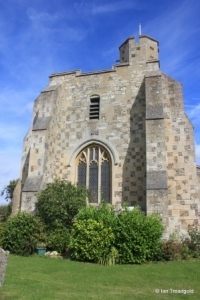 The upper part fell in a storm in 1889 and the tower was eventually repaired by 1931 to its present height with a modern parapet and octagonal stair turret in the south-west corner. 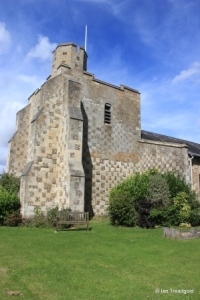 The tower has large angle buttresses on the western corners and is finished in a chequerboard facing of flint and clunch stone. The tower contains the original three bells, although they are no longer swung but are fixed in position and chimed by hammers. The west window is of three cinquefoiled lights under a two-centred arch with modern tracery in a perpendicular style above the lights. 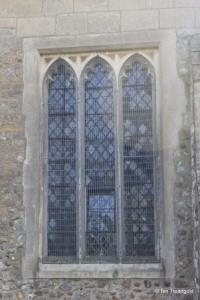 The north aisle follows a similar pattern of windows to that on the south. To the west is a two-light square-headed window. 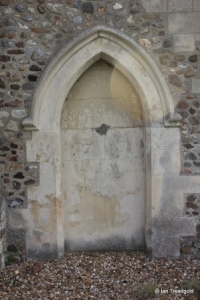 The original north door in a two-centred arch is blocked. 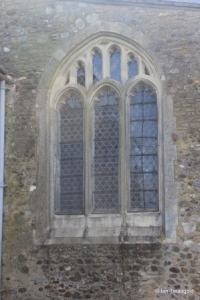 The middle two windows are both two-light windows in pointed arches, the western being uncusped whilst the eastern has trefoiled lights with quatrefoil tracery above. 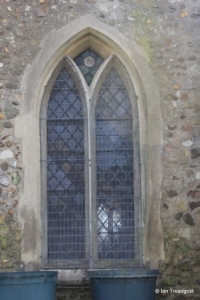 The eastern most window on the north side has three cinquefoiled lights under a square head. The east window of the north aisle is of three cinquefoiled lights under a two-centred arch with modern perpendicular tracery above. 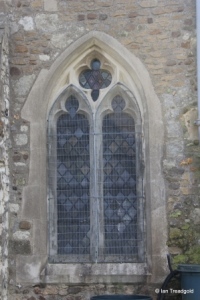 The north side of the chancel has two two-light cinquefoiled windows under pointed arches. 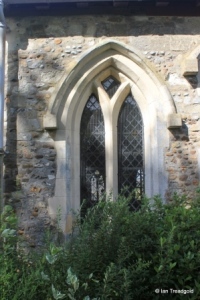 The east window is of three trefoiled lights with C14 tracery above under a pointed arch. 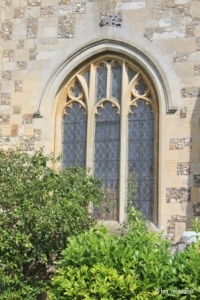 The south side of the chancel has a large three-light cinquefoiled window under a four-centred arch containing stained glass from 1866. To the west are the priest's door and a single light window under a square head. This window also has stained glass dating from 2000. Page last changed 02/09/2014. Reformatted 22/12/2015.